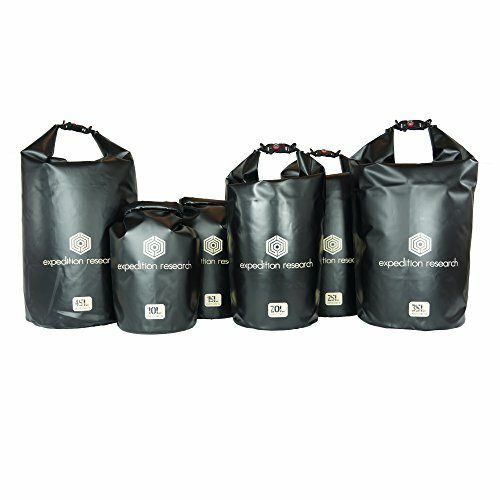 Expedition Research presents our new professional series of ruggidized dry bags. * Buckle is not made in America. Ferrocerium fire starting system: A striker and pure ferrocerium rod can be used to start a fire. This is a lifesaving skill that is learned and requires practice. Locking: By sliding the red compass base, this will prevent accidental opening of the waterproofing 2cm strap. Whistle: We've included an ear piercing, high frequency whistle into the body of the buckle. Compass: The buckle locking system has a small liquid filled compass on the top. This is suitable for general orientation only. The same .5mm reinforced matte black material is used in the construction of our dry bag. We have found that there simply is no better material for strength and ruggedness. My favorite strength demonstration is to fill the dry bag with water. Try this with a so called dry bag from your local outdoor shop and compare the results. Water is heavy, this is obvious, so don't try to fill our 35L dry bag with water. 75lbs is pushing the limits of the bag and your back. And you know what that means…camping! Be sure to take our ruggedized dry bag/ bear bag on your next outdoor adventure. Our bag’s strong, reinforced material will provide the protection you need from the outside elements. Whether you are using the bag to carry water, or simply using our air tight locking system to keep your valuables safe, the versatility of our product is top notch. Not only do we offer a variety of sizes, but our new and improved bags offer innovative engineering that will make your outdoor experience better. Don’t leave home without one. Survival Lilly uses our dry bag as a bear bag on Vancouver Island! Here is a look at the ruggedized dry bags from Expedition Research. These come in various sizes from the small 10Ltr bag, to the large 35Ltr bear bag. These are great for boating, river fishing, camping and even a valuable tool for preppers. Survival Lilly used our dry bag to collect and move sand on Vancouver Island's backcountry. Testing the new buckle on the Ruggedized and Professional Series Dry Bag from Expedition Research LLC. Testing the Ruggedized and Professional Series of Dry Bag from Expedition Research LLC. Testing the Ruggedized and Professional series dry bag from Expedition Research LLC in Algonquin Park Ontario Canada.